For all levels---instrumentalists and vocalists. Hear David Libbman solo over every scale listed in The "Scale Syllabus." He solos on two versions of each scale: the first is slow and simple, and the second is more complex and fast. Stereo separation allows you to practice and improvise too! David is on one channel and Jamey is on the other. An excellent list of piano voicings are included. 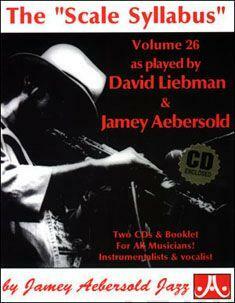 Rhythm Section: David Libbman (Soprano Sax); Jamey Aebersold (p). Includes: Major * Minor * Dom. 7 * Lydian * Harmonic Major & Minor * Augmented * Lydian Augmented * Sus 4 * Hindu * Blues * Whole Tone * Major & Minor Pentatonic * Dim. Whole Tone * Diminished * and 21 more!